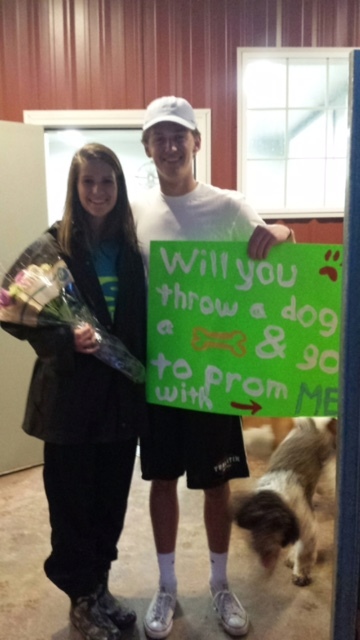 Throw a Dog a Bone….and Go to Prom! Tonight my daughter Ella had the evening dog run. Little did she know that our dog friends in kennel were going help her good friend Cole to ask her to prom. Cole has been Ella’s friend for a few years. It is bitter sweet to see all these kids grow up and head off to their respective college or jobs. As you know these kids don’t just call on the phone and ask to go to the dance…like the olden days. It is fun how creative some kids can be. 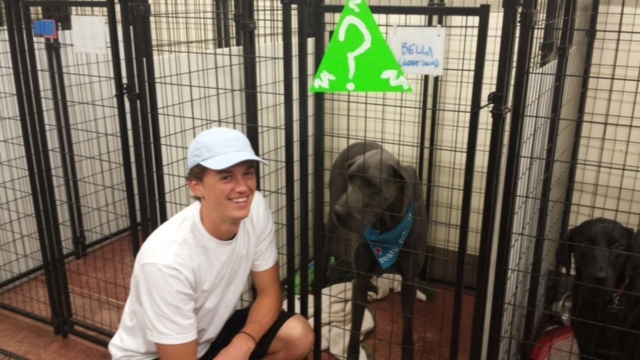 Cole sneaked in the kennel before the dog run and put some signs up. P-R-O-M ? We know Cole and his delightful family loves dogs…the standard poodle kind. Excellent Choice! This will be a fun filled weekend for all of the Tualatin High school kids. For Ella and Cole (and many others) this is their last high school dance they will attend as they graduate in June. Time sure does pass quickly. It wasn’t to long ago that boys had cooties and girls….well…who cares about girls! It brings Derek and I such joy to watch so many good kids grow up to be great people. Dogs and Kids…they all have to grow up sometime. I’m just glad they grow up together. Have a great weekend you two…Enjoy every minute…it is your last.